Are you ready for an ab workout challenge that is suitable for everyone from beginner to advanced? 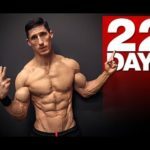 In this video, I’m going to show you a single ab workout routine that you can do for the next 22 days straight that is going to help to carve up that midsection of yours and give you a jump start on getting your abs to pop year round. There are just 6 exercises in this ab workout, each one hitting the abs from one of their primary functions. No equipment is required to perform this ab workout routine. Because of this fact, there are no excuses either. You will be able to do this workout for your abs in just minutes and you won’t need any elaborate setup to get it done. It can be done in the comfort of your own home or in the gym if you so choose. The key to this ab workout plan is that you perform it for 22 days straight. There are two reasons for this time period. First, it gives you an opportunity to start seeing noticeable changes in your abs particularly if you pair this with a dedicated effort to improve your nutrition. You will never be able to see your abs if they are covered in fat. You need to start getting serious about your diet and eating if you want to strip away the fat and show the results of your hard work and effort. The second reason for doing this for 22 days is to help this become part of your lifestyle. They say it takes 22 days of doing something for it to become a habit. We are going to try and create a positive habit here by getting you used to training your abs. Don’t worry. The abs are a resilient postural muscle group that is built for high volume and frequent training sessions. The exercises in this ab workout follow a specific sequence. They start with those that target the lower abs using bottom up movements. These are where the top of the body from the waist up stays rather stationary while the bottom does the movement. This can be seen in the heels to the heavens exercise. Next you perform a bottom up rotation movement. This one is going to be filled by the step through planks. Here you want to try and keep your upper torso still again while you create rotation from the bottom using your legs to step through and across your body. You will be able to feel this burn almost from the first few reps. Keep going until you reach the extinction time as described in the video. Move on next to the midrange movement known as the “X” man crunch. This is a great way to bring both the top to the bottom and the bottom to the top. Aim for completing the 12 reps that are suggested for extinction on this ab exercise and move onto the final three exercises. These will hit the obliques, top down movements and top down with rotation.